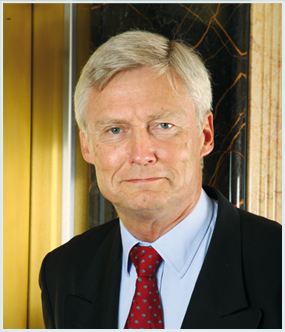 Having finished high school and completed two years of training to become an industrial manager in Bremen, Achim Becker moved to Hamburg in 1970 and began working in the import and export business, with the aim of running one of the branches of the trading company for which he was working in the Far East as an overseas representative. 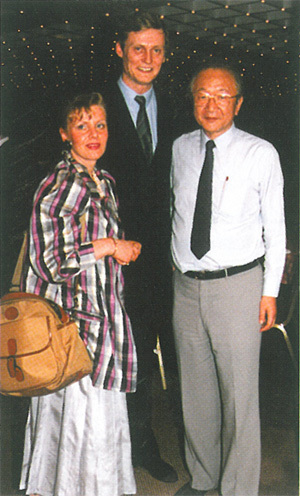 This was just at the time when the big corporations were looking for direct access to their sources in overseas countries by circumventing the Hamburg importers and exporters, and he realized that his great dream of representing a company in the Far East could not become a reality. Driven on by his idealism, vision and dynamism, the young man then turned to a completely new phase of his continuing education. In 1972, he completed his training in banking. 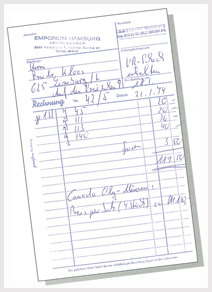 By the middle of 1971, Achim Becker had started up a lively business trading in stamps from home (at that time he was sub-letting a 25 square meter room in an old building). It was through this business that the young businessman first came into contact with coins. It began with German 5 Mark commemorative coins. Business grew rapidly and this quickly necessitated setting up a proper company at the beginning of 1972: the one-man firm EMPORIUM HAMBURG was born. The term “emporium” is derived from Greek and means something along the lines of “storage yard” or “main trading place”. The name was adopted by the Romans when they conquered Greece. At the time of the Roman occupation of Germania in early history, Rome named its settlement on the Elbe “Emporium Hamburgum”. The young businessman Achim Becker rented his first office in the building of a customer and who was later to give him the benefit of his many years of experience: Lange Reihe 81, in St. Georg in the heart of Hamburg. The office on the third floor of the residential and office building, which was built in 1960, was barely 80 square meters in size, including the kitchen and bathroom. The “warehouse” consisted of a safe, into which the coins would only just fit. The furnishings, which were the pride and joy of the young businessman, comprised an entire (rosewood) wall, a (rosewood) desk and three chairs. One for the boss, the other two for customers and visitors. In the same year, the first employee was appointed. He was the local postman. Having just retired, he gave Achim Becker’s company an image that he could not yet convey directly to customers himself, because of his youth. The retired postman was often addressed as if he were the boss. From the old Prussian school, he walked bolt upright, shoulders back, and at 66 years of age and with his gray hair, he made a very respectable impression. Trading solely with German dealers did not satisfy the ambitions of the young businessman, so he systematically made contact with the most important dealers and mints around the world on behalf of Emporium Hamburg. The range of coins, which began with the commemorative GDR coins, grew steadily throughout the 1970s and 1980s. Historical German coins were added. Trade in foreign coins in the Federal Republic and in German coins abroad continually increased in volume. In 1980, an exclusive distribution agreement was concluded with the Berlin East German Commercial Bank. In 1986, the first contract with the US Mint was concluded. That same year, the company took over the whole building at Lange Reihe 81 and an extensive conversion was carried out, and the retail outlet of the EMPORIUM Group was opened. The systematic extension of the company’s international relations continued; countries from Norway to Italy, from Spain to Russia, even including Israel, are among the trading partners of the EMPORIUM Group. The increasing demand for historical coins made it necessary to set up the numismatic division of the Emporium Group in 1983. That same year, the company’s first coin auction took place. Over the coming years, these developed into a magnet for coin collectors from all over the world. The Group continued to drive its development forward and focused increasingly on private customers. Just a year later, in 1984, the Emporium Group extended its retail division, under the name “Emporium Merkator”. Its aim: to supply end customers with coins at an affordable price. Since the company was founded, Achim Becker and the Emporium Group have attended the big coin fairs (fairs oder conventions) in the USA and the most important coin fair (ditto) of the American Numismatic Association (ANA) every year. It is hardly surprising that the business relationships with the most important large US dealers and banks are among the oldest and most valuable of the Emporium Group. In the following years, the important distribution agreement with the best known and most respected mint, the US Mint, was concluded. As a result, the young businessman was a guest of the then US Secretary of State, James Baker at the end of the 1980s. 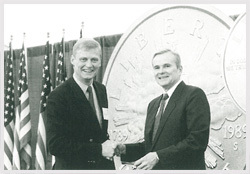 This encounter was one of the company’s highlights, as was the meeting in 1987 with the then American Treasury Secretary Nicholas Brady, as part of the negotiations over the coin program “200 Years of the U.S. Congress”. German unification also left its mark on the businessman and the Emporium Group. Coins played a significant part in the process as historical products, thereby making German unification an important area of business. 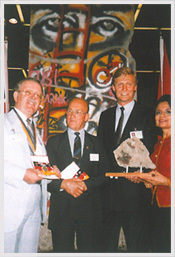 For the big coin exhibition of the ANA in Seattle in August 1990, arrangements were made to transport and display a 4.50 m high, 4 metric ton piece of the Berlin Wall. The graffiti on this piece of the Wall – an anxious figure climbing over the Wall – is reported to have made a great impression on the visitors to the exhibition in Seattle. It is hard to believe that thousands of people poured in to see the piece of wall that week. Incredible, heart-rending scenes were played out at the exhibition site, where the piece of wall stood on several transverse planks, draped in purple, flanked by two video recorders showing a historical summary of how the Berlin Wall fell. This piece of the Berlin Wall went down in history as “Bloody Erich”. On 3 October 1990, it was unveiled in a solemn ceremony on the Capitol Hill in Washington, the capital of the USA, in the presence of the Speaker of the House of Representatives, Thomas F. Foley, the Majority Leader of the U.S. Senate, George J. Mitchell, the German Ambassador to the US, Dr Juergen Ruhfus, and the Mayor of Berlin, Walter Momper. The piece of the Wall then went on a grand tour through the USA and Canada, eventually returning to Seattle to become part of Bill Gates’ collection. Just as much effort has been put into the relationships formed since 1980 with dealers in Asian cities, which have been cemented by visits to the trade fairs in Hong Kong, Singapore and Tokyo in the following years. The minting of a German-Japanese commemorative medal by the Hamburg Mint, on which Achim Becker is shown together with Mr Masamichi Oka, the patriarch of the firm Taisei Tokyo, Japan, represented a particular honor for Achim Becker and the Emporium Group. The Emporium Group has used the opening up of the gateway to central China to make contacts there, including local dealers. The Group has been represented annually at the Beijing coin fair (coin fai/convention), ever since it began in 1995. In 1994, the growth in the size of the wholesale, numismatics and mail-order business made it necessary to find larger premises. 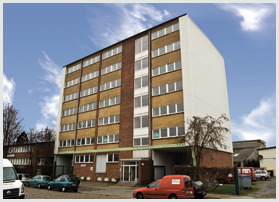 This resulted in the move to Sorbenstrasse, in the district of Hamburg-Hamm. 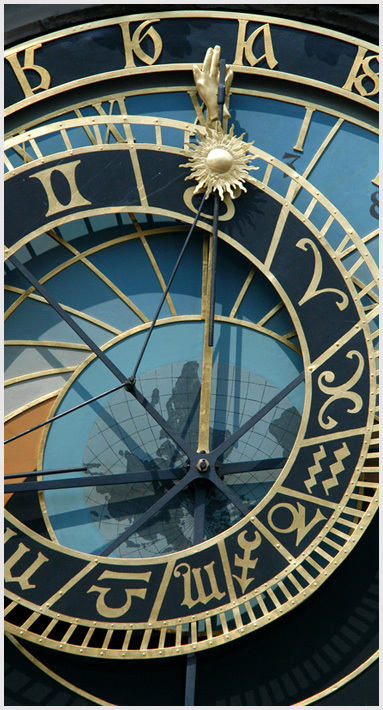 With the introduction of the Euro in 2002, a new chapter in the history of European coins was opened. For the first time, the nations of the “Old World” had introduced a common currency and were growing closer together than ever before. For coin collectors, an entirely new field opened up, which has been served in Germany by the Emporium Group, both in its wholesale and mail-order trade. In this way, its business share of the German market has been secured. Achim Becker, who has been in business for forty years, now knows all of the big dealers and coin mints on the five continents. The company’s many years of experience, its business volume and its reliability have made the Emporium Group into a valued partner throughout the world. Along the way, the businessman Achim Becker has been able to gain valuable insights into people, cultures and their environments on his many travels. In the middle of the 1990s, the desire to build his own business premises became a primary aim. Even while he was still at school, Achim Becker developed two main focuses, which then ultimately forced him to decide between pursuing a career as an architect or a businessman. He opted to become a businessman, but the architect in him has always been alive. A good eye and a creative sense have sparked many ideas over the years, which culminated together in guiding the design of the company building. In his design Achim Becker did not follow the general Hamburg trend for steel, concrete and glass facades. It was to be a building in the old style of the Hanseatic merchants. In the fall of 2004, the company’s new premises the Stoertebeker Building was completed. During the final year of the planning period and the construction phase, the design of the building took on unexpected dimensions that affected everything, down to the last detail. Achim Becker was involved conceptually and with his own hand-drawn sketches in designing every stone and every corner, making it possible to bring a consistent line and strategic vision to the whole property, with its almost 14,000 m2 and four staircases. During the period of the financial crisis in 2008/2009, the Emporium Group added trade in precious metals to its wholesale activities. Now well known on the Internet market at www.silber-werte.de, three traders provide rates for buying and selling silver and gold investment products in any quantity. Since the beginning of time, gold and silver have been seen as a substitute currency and in uncertain times they are still regarded as a safe haven. It therefore made perfect sense to extend the business strategy to include this area. Today Emporium, with its experienced staff and probably the largest stock in Germany, is at the disposal of both the German and international coin trade as a reliable partner. If you want to buy 1,000 Roman Denarii, 1,000 Antoniniani, 1,000 gold Solidi from Eastern Rome, 1,000 Haendlein-Heller, the currency of the Middle Ages, 1,000 gold coins from the Latin Monetary Union (5.8 g), 1,000 silver coins from the German Empire, 1,000 5-Mark pieces from the Third Reich, 1,000 US Morgan or Peace Dollars, 1,000 silver Eagle, Elephant, Philharmonic or Maple Leaf coins, 1,000 Chinese Panda coins, 1,000 sets of Euro coins from 1 Cent to 2 Euros from all of the Euro countries or 1,000 Krugerrand, or if you just want to sell gold, Emporium is the place to come. Whether you want to have your collection valued, sell it or auction it, at Emporium you will always find our staff willing to listen to you, take care of you and help you. With Emporium, you have always made the right choice. 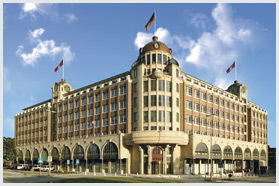 1998 On 21 January celebrations are held in the Neue Börse in Hamburg to mark „10000 days of the EMPORIUM GROUP“.